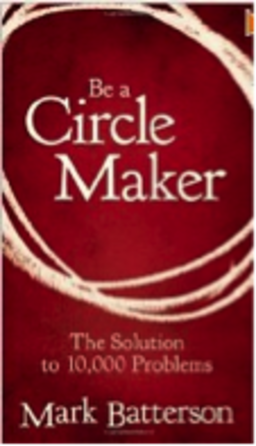 Mark Batterson and his "The Circle Maker" DVD and book series is nothing more than new age mysticism wrapped in a feel-good un-scriptural methodology for prayer. "The Circle Maker" book and DVD series tries to play on emotionalism highs by introducing the "newest" way to reach for God. Dr. Charles Stanley tells why the "Name it, Claim it" is a false "Prosperity Gospel" theology, and has no place in the church. This is the basic concept of "The Circle Maker" book. Dr. Stanley responds to this popular view that a believer can name a need or desire, and expect God to deliver it, in the following video. Rev. Chris Rosebrough has written: What does drawing three circles have to do with "black magic"? The Circle Maker book by Mark Batterson was written a few years back (which continues to shipwreck the faith of the flock today), contains some disturbing parallels with the kind of pagan sorcery used by modern-day witches. A few years ago I found this excellent 15-minute documentary that exposes The Circle Maker's pagan practices. I highly recommend you watch it, and share it with those in your circles (sorry! ), who are caught up in Christian mysticism. You'll be fascinated to hear from those who call themselves witches who are excited about this book, recognizing their practice of “casting a circle,” three times, around an object, person or desire. Be sure to notice at about eight minutes in the similarities between the Circle Maker, the Narnia-Prince Caspian scene and Oprah’s promotion of the book, The Secret. You’ll also want to pay close attention to the words the author himself uses to describe the purpose of prayer and what his desire his for you in the pages of his book. Praying in circles is fast becoming a thing in some Evangelical churches. People have been taught to draw circles around the things they want, or even to walk in circles around the things they are sure the Lord ought to grant them. In either case, they are to pray around those things and in that way to claim them for the Lord. On one occasion when God did not send rain well into the winter (in the geographic regions of Israel, it rains mainly in the winter), he drew a circle in the dust, stood inside it, and informed God that he would not move until it rained. When it began to drizzle, Honi told God that he was not satisfied and expected more rain; it then began to pour. He explained that he wanted a calm rain, at which point the rain calmed to a normal rain. I want to give you three reasons not to pray in circles in the manner Batterson prescribes. What I consider most notable about Batterson’s approach to prayer is that it is extra-biblical. It is not drawn from the New Testament or the Old Testament but from the Talmud. To the Jew the Talmud is the authoritative, binding body of religious tradition; to the Christian it is nothing, no more binding and no more prescriptive than Encyclopedia Britannica. It may be of historical and academic interest, but it does not represent the voice of God to his people. When Batterson prays in circles, he begins with a tradition outside the Bible and then looks within the Scripture to build a shaky support structure. Praying in circles is extra-biblical, derived from a source apart from Scripture. But that’s not all, it’s also patently un-biblical, finding no support in Scripture. It is entirely absent from God’s Word to us. The Bible is not lacking in explicit and implicit teaching when it comes to prayer. Jesus’ disciples asked Jesus as simply and clearly as they could: “Teach us to pray.” When Jesus taught his disciples, he said nothing about prayer circles; if anything, he said the opposite when he told them to pray privately and in a quiet place. When Paul wrote to the people he loved, he often told them how and what he was praying on their behalf, and he said nothing about prayer circles. Praying in circles is absent in any and every form. Praying in circles is extra-biblical and un-biblical, but it is more than that: it is anti-biblical. It directly violates the principles of prayer. When Jesus teaches us to pray, he teaches us to approach God as a child approaches a father, not marching in circles around him, but simply asking with confidence and humility. To pray in circles is to elevate technique at the expense of the heart behind it. To pray in circles is to attempt to manipulate God by action rather than seeking God by communing with him in his Word and prayer. It is nearly indistinguishable from a name-it-and-claim-it kind of Christianity where the things we visualize and demand are the things God must and will give to us, if only we know how to bend his will to ours. Praying in circles is simply the latest in a long list of techniques to exploit our deep-rooted dissatisfaction with our prayer lives. Now listen! We need to pray big prayers and bold prayers. Through Christ Jesus we can approach God’s throne with boldness and confidence; we can be like that persistent widow who asks and asks until she receives. The Lord loves to hear us pray and loves to grant what we ask. But not if we attempt to manipulate him by technique. 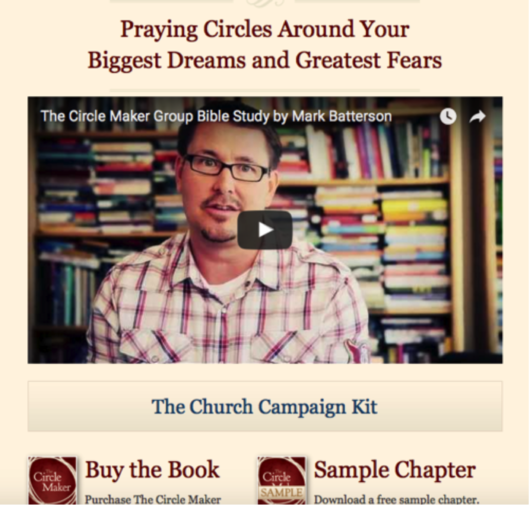 Just two days ago, I published a piece about the book, The Circle Maker, written by Mark Batterson and released in 2012. I'd left the issue alone until then, choosing not to do a book review or a discernment essay on it because it seemed so obvious that this was something Christians should not be involved in. But at the end of 2012, it became clear that Batterson's concept of casting a circle to claim God's promises to unleash our dreams was saturating even the most stalwart bastions of the faith, when the organizers and participant of the "True Woman" conference including Nancy Leigh DeMoss and Joni Earicksen Tada, promoted it. These are elder woman who should be leading us women into a deeper faith, not into occult and pagan practices that originate from outside the Bible. I was pretty shocked. Many other fine essays exist on the internet that show you in biblical terms why Batterson's circle making is unwise and even dangerous, including a review by pastor and Christian book reviewer Tim Challies. So I developed a piece from an angle that demonstrated in pictures that the practice Batterson promotes is not new and it is not Christian. I am contending. Hopefully this will help someone be discerning, not just of The Circle Maker but in general and armed for the future by unpacking the techniques used to attract people to the book and its premise, and how they are the same that satan used in the Garden against Eve. "Do you ever sense that there's far more to prayer, and to God's vision for your life, than what you're experiencing?" This is how successful advertisers always begin their pitch. It is how satan began his pitch. He approached Eve and made her doubt what she knew, so she would be open to hearing a solution to a problem she didn't know she had. Then satan, taking a cue from Ron Popeil, said, 'but wait, there's more!' And satan presented to her a solution to her problem she didn't know she even had until satan pointed it out. And like all false doctrine, it spreads quickly, corrupting others right away. So there was Eve, the only sinless woman to ever live and she dwelled in utter perfection. The air temperature was perfect. Her surroundings were beautiful. Her body was perfect inside and out. The animals were perfect. She was never hungry or cold or angry or had any ache whatsoever. She had perfect harmony with her husband and perfect unity with God. I mourn daily that so many Christians forgo the praise that is due the Lord and forget how glorious a life we are actually living. Though we do not dwell in perfection like Eve did, we have perfection inside us. First, let's stop a moment and thing of how full our lives really are. We have been saved by grace. This is monumental! As Dr MacArthur preached, we should be "adoring God for our eternal inheritance." When did we become discontent with the universe's most glorious act, the salvation of a sinner to the holy breast of God!? But wait, there's more! God dwells inside us!! Wow! What a gift! "Nevertheless, I tell you the truth: it is to your advantage that I go away, for if I do not go away, the Helper will not come to you. But if I go, I will send him to you."... (John 16:7). "But the Advocate, the Holy Spirit, whom the Father will send in my name, will teach you all things and will remind you of everything I have said to you." (John 14:26). But wait, there's more! If all that wasn't enough, we have the opportunity to pray to Him, and He listens. Have we become inured to the fact that God is God, He who calls Himself I AM, will listen to our petitions and pleas? Far from being disinterested or inattentive, Jesus is monumentally interested in bringing about Good for our sakes. He didn't save us just to wander off and sit on another planet contemplating His navel. He is involved with His people. He accepts praise and worship, and He ordains good for us. He listens to our prayers! "Likewise the Spirit helps us in our weakness. For we do not know what to pray for as we ought, but the Spirit himself intercedes for us with groanings too deep for words." (Romans 8:26). Jesus sent the Spirit to inspire men to write His words down, so that we could always have its wisdom and comfort to guide us also. The Spirit makes the words come alive and since they are eternal and come from the holy place, the words in the bible are eternally good. "All Scripture is breathed out by God and profitable for teaching, for reproof, for correction, and for training in righteousness," (2 Timothy 3:16). My answer is no. No, I don't sense there is far more to prayer. I trust that there is and I trust the Lord to take care of things whether I "sense" it or not. No, I do not sense there is far more to God's vision for my life, I know there is. I trust Him to unfold it in His timing and in His way. No, I do not sense there are more experiences to have, I know that there are. I trust the Lord to bring me along in sanctification whether I 'feel' it or not. I trust the promises in the bible about what my daily life will be like. I trust what God hath said. I get sad when adults are so undiscerning. I get upset when undiscerning adults taint the children. Jesus is very protective of the children. They are the means by which the successive generations carry the faith. (Joel 1:3). And yet on August 6, 2013, The Circle Maker for Kids will be released. An undiscerning generation will be teaching the next generation to rely on sensing, personal experience, and wiccan circle casting for their worship. Within two years of the original book's release, do you see how quickly we have been made merchandise of? For kids, for students, the daily journal, the curriculum, prayer challenge, it goes on and on. Do you see the original book's cover in hardback, 'the solution to 10,000 problems"? Did you know there were 10,000 problems that Mark Batterson can help you solve? I thought the Bible was the solution to 10,000 problems! A classic advertising technique- you have a problem, and here is the solution. My heart cries out, why, o why, aren't the bible's solutions good enough for people? The blurb says "The Circle Maker will help you bring your God-given dreams into being through tenacious prayers that honor God and make the impossible come true." You...your... my prayers will make my dreams come true...let's cut the middle part from the sentence and just say what is really his truth: "The Circle Maker will ... make the impossible come true." It is God who answers prayer a God who does the impossible. Not my prayers, not my faith in my prayers not my method of prayer, and not my tenacity. Jesus, please come soon and save the children from this ruinous generation! Below I've pasted "Efficient Advertising Techniques". Be aware when you are being sold a bill of goods and being made merchandise out of. It begins with a question, and intimating you have a problem you didn't know you had. "Advertising techniques can be of many kinds. All creative advertisers use some of the following techniques and tricks to grab the potential consumer's attention and turn it to sales." "Nothing works better than this technique. Humans, by nature are always drawn towards the unknown, or in this case something new and advanced. Arousing curiosity with words, prints, images or visuals will definitely make an impact. On an average, an individual spends less than 5 seconds to go through an entire ad. If your subject does not arouse curiosity immediately, it is a lost opportunity. A well-crafted ad should be eye-catching, and difficult to ignore." "Do you ever sense that there's far more to prayer?" "Most brands are associated with some pre-defined character, and they need to be re-emphasized with every new service advertised. The headline must promise a benefit for the consumer, because in most instances it is the headline that sells the product more than the copy, images or the celebrity. Advertisements should also carry general information about the service center address, phone numbers, credit cards that the business accepts, and the name of a person to ask for when calling for more information." "In this powerful booklet, excerpted from THE CIRCLE MAKER, Batterson helps you uncover your heart's deepest desires and God-given dreams and unleash them through the kind of audacious prayer that God delights to answer." "Many advertisers attract attention by pulling at the heart stings and triggering emotions. An emotional response is by far the most powerful reason for making decisions. Emotional and rational thoughts are interdependent, as the ability to decide rationally is determined by issues that drive the emotions. We get more attracted to products and services that make us feel good and safe. The concept of emotional appeal are best seen in insurance ads made world over, and also companies that associate their sales with social upliftment causes." "How big is your God? Bigger than a positive MRI or a negative evaluation? Bigger than your secret sin or secret dream? Is He big enough to heal your marriage or your child?" "In most houses, children have a say in every big or small purchase made. Most parents just give in to the tantrums, a fact well-known to the advertisers. Out of ten commercials one sees through any medium, 8 have children featured in them who are generally a little more perfect than the target audience. These perfect children then go on to become role-models that have to emulated by other children." 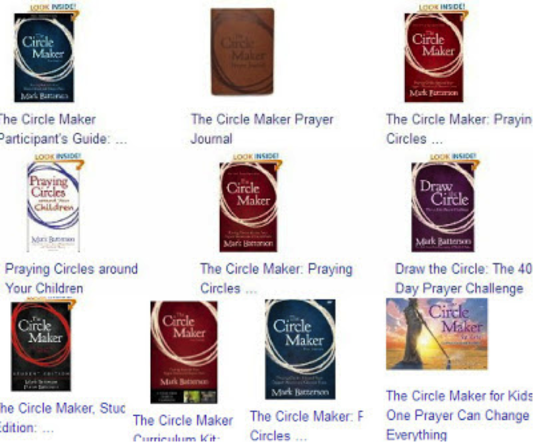 "The Circle Maker for Kids: Basing this story on his adult bestseller The Circle Maker, Mark Batterson shares the ancient Jewish legend of Honi the Rainmaker with children to teach them about the power of prayer. Ages 4-8." Oh, my. I. Truth can always be tainted by throwing in a little falsehood. And, anyone can be deceived by half-truths or a mixed truth or by the Bible not being taken in context. This is what false conversions and deceptions are all about. II. Jewish Legend must not serve as a Christian prayer model, even if it does somewhat “overlap” with biblical themes… especially of a legend who is said to have slept 70 years under a tree and planted trees all across Israel. Sound familiar to Rip VanWinkle or Johnny Appleseed? A. Even though Josephus and the Talmud record Honi as a real man that lived, and as a “righteous man” (whatever that meant to Josephus), we must limit our authority for faith and practice to the Bible. 1. In Jospheus’ account, Honi cries out to “god, the king of the whole world,” & “lord of the world” NOT “God, the maker of heaven and earth” (Ps. 134:3; 146:6; Ps.121:2; Gen. 1:1) as other biblical intercessors. 2. Honi is not even considered apocryphal to OT and NT scholars. He is therefore classified as legend to the Jews and in their Talmud (stories) much like Rip Van Winkle or Johnny Appleseed are to annals of Anglo fable. 4. Though Josephus records miracles of Honi’s life or supposed vindications of Honi, Josephus was not (as we can tell from his Roman allegiance and unsympathetic accounts of Jesus Christ) a believer in the one true God. Magic (as opposed to God’s power) is powerful but not good. We are not to model prayer after extra-biblical examples. III. Using “circling” and as an organized metaphor for focusing our prayers and not relenting until we see the answer (praying through) was not wisely chosen; because “circle casting” is undeniably occult practice. A. Mark does a thrice-round circle in every DVD video, according to occult prescription, as opposed to just once around. H. Praying Through, especially Praising Through (pp. 39, 164) are also very familiar concepts to me, which I find refreshing to see mentioned in Mr. Batterson’s book. But again, these must be preceded by one’s having located assurance of God’s promise within all its proper contexts. The unstudied and non-surrendered cannot possibly point their finger to a Bible passage with a selfishly delusional fervor and expect God to honor their wishes. There does come a time when the diligent searcher is convinced of a reality he sees in God’s Word through illumination, and that, it is applicable to his own situation. At that point, praying through/praising through are simply the exercise of diligent patience and thanksgiving in faith, in order to obtain what GOD promises (Hebrews 6:10-20). Let’s not make it mystical. 33“Again, you have heard that the ancients were told, ‘YOU SHALL NOT MAKE FALSE VOWS, BUT SHALL FULFILL YOUR VOWS TO THE LORD.’ 34“But I say to you, make no oath at all, either by heaven, for it is the throne of God, 35or by the earth, for it is the footstool of His feet, or by Jerusalem, for it is THE CITY OF THE GREAT KING. 36“Nor shall you make an oath by your head, for you cannot make one hair white or black. 37“But let your statement be, ‘Yes, yes’ or ‘No, no’; anything beyond these is of evil. A. The surrender of one’s own will and desires is paramount in prayer, according to the Lord’s prayers in Luke 6 and in the Garden of Gethsemane. Sometimes God’s plan for us looks nothing like our “biggest dreams.” It looks more like death and the cross. B. The greatest belief by Satanists and New Age philosophy (exemplified in books like “the Secret”) is the promotion of “self” and finding our “own way” to spirituality. When we speak about “praying through” (staying in the circle or keep circling), we need to remember that without the surrender of our will in order to submit to God’s via the Word, we are either demanding from God–not cool–or praying to another god entirely, especially if we have drawn literal casting circles. V. While Mark Batterson literally applies the legend of Honi the Circle Maker, he allegorically applies the Bible’s true and historical Jericho account and the Promised Land & misinterprets Numbers and Exodus as well as parables to further advance/or confuse “self” interests with prayer. D. I must say that pages 28-31 is very refreshing. One word needed, though… Consistency. VI. The whole premise of Chapter 5, “Cloudy with a Chance of Quail” is sorely misleading. C. Mr. Batterson should have at least cited the source, if not given a balanced teaching/warning that one can obtain by comparing the two accounts of miraculous quail provision. D. On pg. 54-55, the author directly quotes the wording of the Numbers 11 passage, but he makes no mention of God’s according judgement on greed and complaining. E. On pg. 56, Batterson lifts the Parable of the Sower & Soils out of context and inserts narcigesis, in direct opposition to what Jesus says the parable teaches. Again, he does not reference his passage. But, this parable comes out of Mark 4:8 and is explained BY JESUS in vv. 13-20. It has nothing to do with God’s promising a building. It does have to do with whether one’s own life receives the Word and allows the Word to produce fruit (like the Word, Jesus) in one’s life… or, does one let TRIALS and CARES and PERSECUTION and WORRIES OF THE WORLD and DECEITFULNESS OF RICHES and the DESIRES FOR OTHER THINGS enter in and choke the Word, rendering it unfruitful. Given the curse of the quail, the parable of the soils, and warnings by Paul to Timothy (1 Tim. 6:6-10) about desiring to be rich, I find it hard to accept Batterson’s teaching. What comes into our minds when we think about God is the most important thing about us. The history of mankind will probably show that no people has ever risen above its religion, and man’s spiritual history will positively demonstrate that no religion has ever been greater than its idea of God. Worship is pure or base as the worshiper entertains high or low thoughts of God. For this reason the gravest question before the Church is always God Himself, and the most portentous fact about any man is not what he at a given time may say or do, but what he in his deep heart conceives God to be like. We tend by a secret law of the soul to move toward our mental image of God. This is true not only of the individual Christian, but of the company of Christians that composes the Church. Always the most revealing thing about the Church is her idea of God. –A.W. Tozer, The Knowledge of the Holy (New York: HarperCollins, 1961), 1. Quite the opposite affect, don’t you think? (This article, in pdf format, retains the links, in blue type, so you can click and follow them to the material referred to). As if being a pastor is not busy enough Batterson, in true emergent style tries to cast his fame and exceeds his pastorate position by authoring multiple books, including us In a Pit with a Lion on a Snowy Day(2), Wild Goose Chase(3), and Primal: A Quest for the Lost Soul of Christianity(4). His latest and most erroneous writing is "The Circle Maker: Praying Circles Around Your Biggest Dreams and Greatest Fears"(5) which hit book stores this last December 2011. Seems to me if he would spend less time writing and more time being a pastor he may be a better pastor but that would go against the Emergent Pastor protocol to actually feed the members of their church. Mark Batterson is your typical Emergent "Seeker Friendly" pastor by which if you mean typical by the way he commandeers Scripture and twists it to mean what it is not. Batterson is guilty of falling into the trap that most Emerging Pastors fall into; the pit of narcissistic eisegesis. That is to reading oneself into biblical text that has nothing to do with that person, situation or church. His typical Sunday message resonates more about social justice and biblical obfuscation than actual solid exegesis of biblical Scriptures. When preaching he is of guilty of “Long Law” preaching. In other words, he is preaching more on the Law making the Law take the place over the Gospel. This can be seen in many of sermon series, including in his most recent one entitle “IF” which can be found at http://goo.gl/epdsS. This sermon series is base on “IF” you do these certain things than God will…. The use of the word “IF” turns God’s love in these sermons to conditions based on our obedience to Him in order for Him to love us. This is not the Gospel neither is this the truth of God’s Word. God’s love is not dependent on us and what we do. God has foreknown His elect before time; Romans 8:28. If this was the case, their would be no Grace. Batterson’s “IF” series violates the very tenants of Scripture and teaching on what the Grace and unconditional love of God is. Galatians 3:10 For all who rely on works of the law are under a curse; for it is written, "Cursed be everyone who does not abide by all things written in the Book of the Law, and do them." 11 Now it is evident that no one is justified before God by the law, for "The righteous shall live by faith." 12 But the law is not of faith, rather "The one who does them shall live by them." 13 Christ redeemed us from the curse of the law by becoming a curse for us—for it is written, "Cursed is everyone who is hanged on a tree"— 14 so that in Christ Jesus the blessing of Abraham might come to the Gentiles, so that we might receive the promised Spirit through faith. 15 To give a human example, brothers: even with a man-made covenant, no one annuls it or adds to it once it has been ratified. 16 Now the promises were made to Abraham and to his offspring. It does not say, "And to offsprings," referring to many, but referring to one, "And to your offspring," who is Christ. 17 This is what I mean: the law, which came 430 years afterward, does not annul a covenant previously ratified by God, so as to make the promise void. 18 For if the inheritance comes by the law, it no longer comes by promise; but God gave it to Abraham by a promise. 19 Why then the law? It was added because of transgressions, until the offspring should come to whom the promise had been made, and it was put in place through angels by an intermediary. 20 Now an intermediary implies more than one, but God is one. 21 Is the law then contrary to the promises of God? Certainly not! For if a law had been given that could give life, then righteousness would indeed be by the law. 22 But the Scripture imprisoned everything under sin, so that the promise by faith in Jesus Christ might be given to those who believe. 23 Now before faith came, we were held captive under the law, imprisoned until the coming faith would be revealed. 24 So then, the law was our guardian until Christ came, in order that we might be justified by faith. 25 But now that faith has come, we are no longer under a guardian, 26 for in Christ Jesus you are all sons of God, through faith. 27 For as many of you as were baptized into Christ have put on Christ. 28 There is neither Jew nor Greek, there is neither slave nor free, there is no male and female, for you are all one in Christ Jesus. 29 And if you are Christ's, then you are Abraham's offspring, heirs according to promise. As you tell from the Apostle Paul's writing the way we are to handle the Law as New Testament Christians is not the way Mark Batterson handles it or preaches how to handle it from his pulpit. Batterson is also guilty of associations with new age mystics and teachings and openly supports their writings and philosophies, which would explain a lot of his new age philosophies and principles in his preaching at NCC and in his books. His public reading list also includes several other New Agers and mystics: Jack Canfield, Daniel Goleman (The Meditative Mind), Gary Thomas (Sacred Marriage, Sacred Pathways), Leonard Sweet, Tony Jones, Brian McLaren, along with several others. (6). In another typical almost now comical Emergent swagger, Batterson violates one of the basic characteristics of being a pastor, that is to be above reproach as found in 1 Timothy 3:2 and in Titus 1:7. According to Ken Silva, pastor-teacher and author of Apprising Ministries in his article entitled “THE COMMENTS THAT MARK BATTERSON DOESN’T WANT YOU TO SEE” Batterson when questioned by Silva in a blog comment, erased the questioning and called Silva a “Pharisee”. The full article can be found at http://goo.gl/dKc5G. Thus proving that Batterson believes he is above reproach. This type of attitude, as seen above, is typical of not only Batterson but many of his emergent cohorts. This type of “don’t touch the visionary” leadership can not only be found at National Community Church but many other “seeker friendly” churches that elevate the pastor over the Word of God, to the level of Fuehrer. One way of achieving this is to use “multi-site” locations like used at NCC. Multi-site locations, if you are not familiar with them, are when you have one church and with one pastor that is simulcast to multi locations thus making many little “churches”. In this set up you have one pastor that leaded all locations and no pastors at those other locations thus leading to a figurative CEO Pastor figure-head that has reign over all sites and power. This type of site control allows complete control over each site and thus allowing that one pastor to project his “vision” of what the church should be to everyone with out a challenged. This use of “multi-site” campuses can lead to a dangerous a style of pastor-worship in which what the pastor says and what his “vision” calls for, supersedes what the bible teaches. Batterson seems to make use of this “multi-site” style a preaching with much effectiveness. Over all Batterson is your typical “vision,” "seeker friendly" oriented pastor who follows the lead of his special “vision” from God that trumps the written Word of God. If you are attending National Community Church in DC, or any of it’s multi-sites, be very leery of Batterson and his teachings and promotion of Law over Gospel. While the Law is good for showing us our sins it won’t save you only preaching Christ died, buried and resurrected; in other words the Gospel will save you. Preaching the Law all the time will only leave you entrenched in your sins.